Often when you are working on your page you need to disable for visitors it for some time. However you also want your users to see some information what is going on, and that your site will be coming soon. That is when you should use maintenance mode or coming soon page. Your website can get stuck in WordPress maintenance mode if something crashed during updates. When WordPress is updating theme, plugins or core and you visit during that time your front-end site you can see message “Briefly unavailable for scheduled maintenance. Check back in a minute.”. WordPress enables this maintenance mode so visitors would not see broken site during process of updating files. To turn WordPress in this maintenance mode, it creates special file named .maintenance and it is placed in main directory of WordPress, in same place where you will find wp-config.php file for example. If for some reason your page got stuck in this mode, then by logging in to your FTP and deleting this file you will make your site work again. It is also worth knowing that even if your site got stuck in WordPress maintenance mode, it will be like this only for 10 minutes, as after that time WordPress ignores .maintenance file and displays your site normally. That is also why you can’t use this way to make your site go to WordPress maintenance mode, as it requires additional actions to make it work. Using plugin for setting up your under construction page is very popular solution. It is also theme independent in most cases, so it is good for switching to different themes for example. There are few plugins that could work for this, but I will advice here most popular one – WP Maintenance Mode. How to use WP Maintenance Mode ? First you have to install it of course. You can do it from your admin panel in plugins menu by searching for “WP Maintenance Mode”. Next activate it and go to plugin settings in Settings -> WP Maintenance Mode where you can setup everything. In General tab you can set main things about your coming soon page, like activating it or who can bypass maintenance mode. In Design tab you setup what exactly will users see, when they visit your page. There is also Modules tab where you can add counter for example or other prepared modules. Settings are pretty straightforward and gives enough flexibility for most use cases. In many themes you can use build in feature to activate Maintenance mode. It gives you option to use any page as your under construction page, so it gives you much more power in design. Another advantage is that you don’t need extra plugin for it, and as it well known – less plugin you have the faster is your site. Lets see how maintenance mode works in Rife Theme as example. When this feature is active you, as administrator, will see whole page normally when you are logged into WordPress. However your visitors will see page that you have selected in Maintenance Mode settings. What is important, is that this page will be displayed for them without theme header and footer. This way they will not see any links to other pages, that could confuse your visitors. Those links will also not be indexed wrongly by search engines while maintenance mode is active. How to activate maintenance mode in Rife theme? 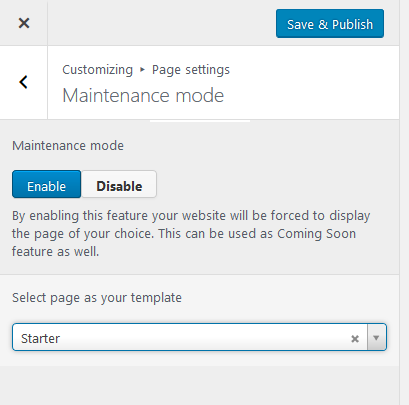 When theme is active, go to Appearnace-> Customizing-> Page settings-> Maintenance mode. There Activate feature and select page that will be displayed as your coming soon screen. Many hosting providers offer staging server feature. This is special option that creates copy of your website, where you can test new plugins, themes or settings without anyone being able to see them. This is much better option then testing new things on your production website and accidentally breaking it cause of this. It also doesn’t block your production website, like maintenance mode does. Kinsta hosting is one example of WordPress hosting that offers this. What is also great about staging server, is option to push all your changes to production site without need to recreate them again on live site Whole process is described here.